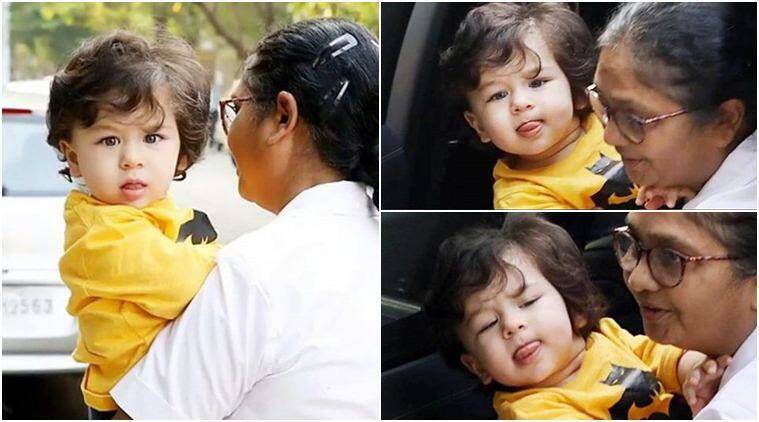 Little son of Kareena Kapoor Khan, Taimur Ali Khan seems to be getting used to the camera attention as we see him all comfortable, rather posing for the shutterbugs at times. When Taimur Ali Khan is accompanied by his beautiful mommy Kareena Kapoor Khan, the pictures become even more adorable. The pictures of Taimur Ali Khan always make it to the top of spotted celebs list. This star kid has made everyone his fan and needless to say, all the clicks of this little Nawab go viral everytime. But when he is accompanied by his beautiful mommy Kareena Kapoor Khan, the pictures become even more adorable. It was a Sunday outing for Taimur and Kareena to his grandmom Babita’s place. Soon when the mother-son were spotted together, fan pages got flooded with their pics. Little Taimur seems to be getting used to the camera attention as we see him all comfortable, rather posing for the shutterbugs at times. Very recently Kareena and Saif Ali Khan’s little superstar, Taimur, unfazed by the media attention went for his kids’ gym sessions with his Nanny and gave a winsome smile to the onlookers. It was his eyes that were fixated on the camera lens of the paparazzi and his tongue stuck out as if he is teasing his many fans who wait to catch his single glimpse.